This week, all the hype about college admissions comes out. Blah blah blah this college admitted only 7%. Blah blah blah Oh Yeah? We admitted only 6%! We're better. So, I says to myself, "Myself, I says, what is the real measure of the best college?" And it became clear: The best college is the one everyone wants to copy!" And then I asked myself, "How do you do that?" "Why," I replied, "by copying the name." 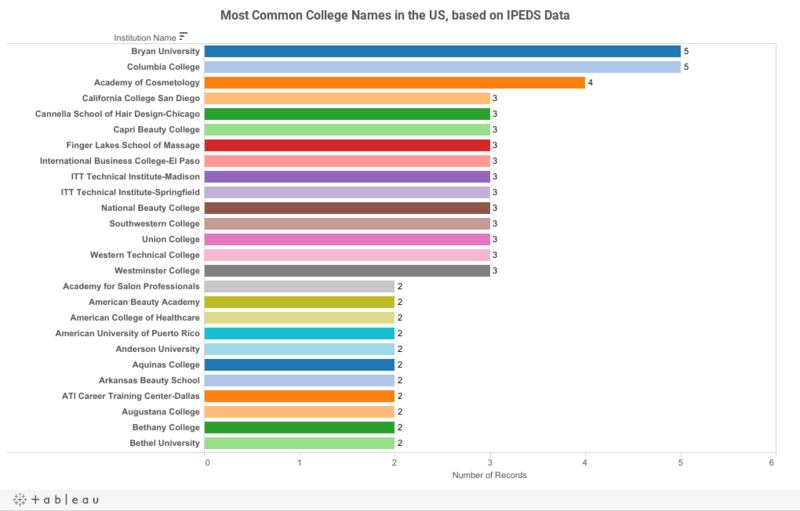 So here are the most common names of colleges in America. As you can see, Columbia College and Bryan University are duking it out for the top spot. If DeVry got their act together, they could win every year, as an informal analysis says there are about a bazillion of them. So, sorry Duke (if that is your real name.) Clearly, no one wants to be associated with the likes of you.